Three Over Four (as Aaron Templer LLC) helped create the strategy, brand, and marketing communications platform for a Colorado Secretary of State-funded, statewide apps and business challenge called Go Code Colorado. We then helped run it, directing and managing all the marketing communications and brand management for the program. Losing Go Code Colorado from Go Code Colorado on Vimeo. Managed by Three Over Four; shot, directed, and edited by Hoptocopter Films. Throughout his tenure, President Obama championed the idea of Government 2.0, a more efficient and less bureaucratic approach to government initiatives that more closely mirrors the private sector. This inspired government leaders to become more transparent and open data policy was an important step. The Colorado Secretary of State’s office wanted to leverage the mass of public data produced every year. Brian Gryth was part of the operational support team and as an open data activist and cofounder of Open Colorado, he wanted to put this task into the hands of developers through a public data movement. But there were hurdles. It had no model or framework to start from. It had to prove itself across multiple stakeholders to gain funding. It had to go beyond a single-event hackathon to produce sustainable, funded, public data-based apps that returned value to businesses. It needed to have myriad types of events (workshops, casual meetups, lectures, all-night coding competitions) appealing to technologists, economic officials and entrepreneurs. It couldn’t fall into the Denver-centric trap. It needed to be a state-wide effort. The Secretary of State team envisioned a series of events more engaging and sustainable than a one-time hackathon. But they didn’t know their audience. And as a government entity, they weren’t familiar with the entrepreneurial world of branding and marketing. So the Secretary of State’s office had to pivot — substantially — and let this new team run with the idea. Go Code Colorado | Commercial 2017 from Go Code Colorado on Vimeo. Managed by Three Over Four; shot, directed, and edited by Hoptocopter Films. Aaron Templer LLC (now Three Over Four) and LadyCoders (now Equili)—under contract with Commerce Kitchen—developed a model for a statewide, three-month apps challenge, bringing developers and entrepreneurs together to build successful business apps with public data. The breakthrough idea: Hold the meat of the program—an app challenge that most resembled a hackathon—simultaneously in five cities across the state. Choose two winning teams from each location, and send the 10 winning teams to a mentor weekend where they could rub shoulders with tech developers and entrepreneurs to hone their ideas. And then bring them all to Denver for a best-in-class final pitch event where three teams would be awarded real, big-money contracts with the state. Its name? Go Code Colorado. This concept, which by the second year was run entirely through a partnership between LadyCoders LLC and Aaron Templer LLC, grew to over 12 annual events, all supported by several software project management platforms, managed by an assembled team of 15 marketing, event, and community-building experts, including location-specific specialists and multiple project managers. Brand management was a totally new discipline for the Secretary of State’s office. This was complicated by Go Code Colorado requiring a hybrid brand platform to bridge the public and private sectors. How do we stand out amidst local hackathons and civic engagement opps? How do you brand something that’s not quite a hackathon, but not quite an accelerator? How do we overcome government’s reputation for bureaucracy to entice app developers and entrepreneurs? How do we evolve the government’s identity toward technical innovation? Research was our first step. We interviewed hackathon coordinators, competitive developers, entrepreneurs, business leaders, and coding community leaders. We facilitated focus groups. We talked about civic engagement, innovation, business obstacles and peer support. Another quagmire was trying to build a concrete brand for the very abstract idea of technology. The resulting brand platform included several dimensions around which to build an identity and integrated messaging: culture, key stakeholders, values, personality and essence. Each dimension included comprehensive definitions and brand governance was an ongoing task. How do you explain the benefit of a mentor weekend to someone who has never launched a business or scaled an app? How do you help a government official understand the value of a fail-and-learn environment to a burgeoning entrepreneur? In year two, Andrew Cole took over as Go Code Colorado’s program manager for the Secretary of State’s office. Marketing demanded strategy, strength and several evolving tactics, the effectiveness of which depended on strategic alignment, tight timelines and constantly anticipating unexpected issues. We thought long-term and mapped a brand journey across multiple years. This included award submissions, educational events and partnerships with innovation centers that could fuse Go Code Colorado marketing materials with other burgeoning and recognizable brands along the Front Range. Each year we went back to the drawing board to understand what the next iteration of Go Code Colorado should symbolize. How should it be growing? How should it be changing? What had we learned? To create brand affinity and keep participants engaged we designed a unique identity every year, building off the core but tapping into the evolving zeitgeist and relevant trends. Community Building in Grand Junction from Go Code Colorado on Vimeo. Research from focus groups showed that this endeavor included disparate audiences: entrepreneurs, software developers, economic development officials, meetup organizers, and coworking facilitators. Their shared passion? Innovation. It was important to build relationships face-to-face, something our government client taught us and that we incorporated into our strategy. As we traveled across the state, we ventured into targeted meetups, co-working facilities, economic development offices, and developer garages, as well as demographic-specific groups like women in tech, veterans and high school students. And we realized we had a lot to offer: enticing access to tools, expansive data, entrepreneurial mentorship and the chance to win real seed money. In short, it was clear Go Code Colorado could act as a magnet to help existing efforts to build tech entrepreneur communities. We were seeking not only participants, but partners, judges, host locations and other supporters. And since we could align program values and outcomes with the community, we built deeply engaged relationships across the state. But not all communities are created equal. Some locations like Durango and Grand Junction had tech communities that were barely off the ground. We knew we had to let them lead. In Denver, nationally renowned as a center of start-up action, we leveraged expertise and mentorships to feed competitors. Fort Collins and Colorado Springs had a foundation, but soon realized Go Code Colorado could be a galvanizing force to build their talented communities. But evolution was critical in order to remain on the leading edge—something our audience demanded. So we built and innovated on what we learned. “When it came to feedback, Aaron and Elaine were never offended, always flexible. They not only listened, but made adjustments based on what they heard,” said Hannah Parsons, former co-owner of Epicentral Coworking and current Chief Economic Development Officer at Colorado Springs Chamber and EDC. Go Code Colorado’s Value to Business from Go Code Colorado on Vimeo. Managed by Three Over Four; shot, directed, and edited by Hoptocopter Films. Sponsorship acquisition included two major priorities. First was validation. We knew that enterprise buy-in from tech giants like Google would prove our worth. Their names elevated the event into much more than just a hackathon. It gave Go Code Colorado status in the coder community and that mattered. Second was resources. Sponsor funding allowed us to keep events free and participants well fed. Their data created a richer competition, their technologies made operations flow more smoothly, their offices provided a collaborative workspace and their innovative mentorship allowed competitors to learn constantly and build a powerful, lasting network. Finally, we were able to secure automatic interviews to world-renowned accelerators and expenses-paid trips for the winning teams, which gave legitimacy to the Go Code Colorado program. Selling these major players on the concept required storytelling and a compelling demonstration of value. We secured sponsorships from the likes of Google, CA Technologies, Twitter and Salesforce, and incubators like TechStars, Boomtown and Foundry. Blending the spirit of developers, entrepreneurs, economic officials and community leaders into one united program with aligned values was no simple task. And that was just the atmosphere. Logistics were complex and critical. 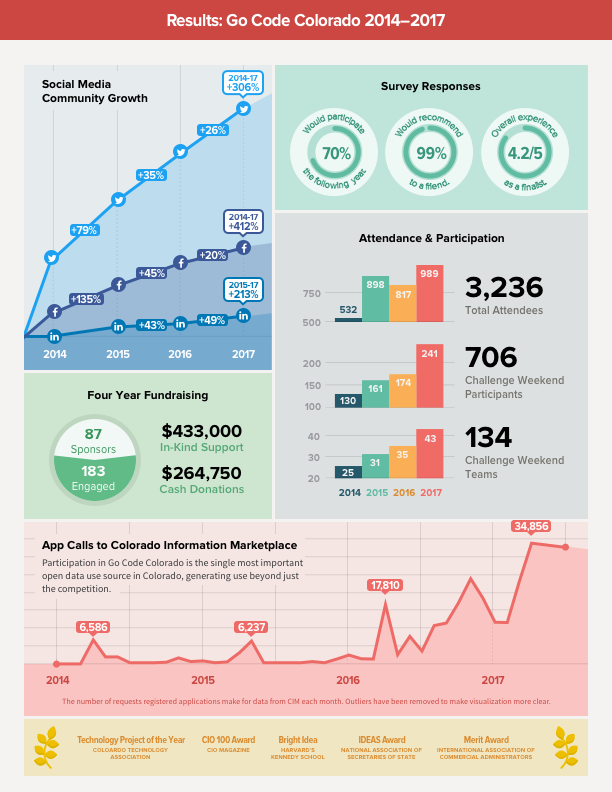 In the spirit of open data, all Go Code Colorado events were free and open to the public, and therefore strongly community-driven. To keep one eye on the bigger picture and one eye on myriad details, we managed a team of specialists on the ground at each location, arming them with materials and checklists, and setting goals and expectations. From the outset Go Code Colorado was a very collaborative effort involving several brilliant minds, many of whom have gone on to other amazing things. It all started through a partnership with Commerce Kitchen, led by Jamie Hollier and the brilliant marketing minds of Leslie James, Michelle Drumm, and Natalie Winslow (Michelle and Natalie now run New Why, check them out). And, as mentioned, we ran Go Code Colorado in partnership with Elaine Marino who now runs her company Equili.